Carbon dioxide removal (CDR) techniques that aim to remove and sequester excess carbon from the atmosphere have been identified as an important part of the portfolio of responses to climate change. These approaches have been garnering new attention as the international community has identified lower thresholds for global temperature increases, which can only be accomplished with net negative carbon emissions to the atmosphere. However, many of these CDR technologies are not yet viable in terms of cost and scalability, and any potential risks that deployment of these techniques would entail are not fully understood. 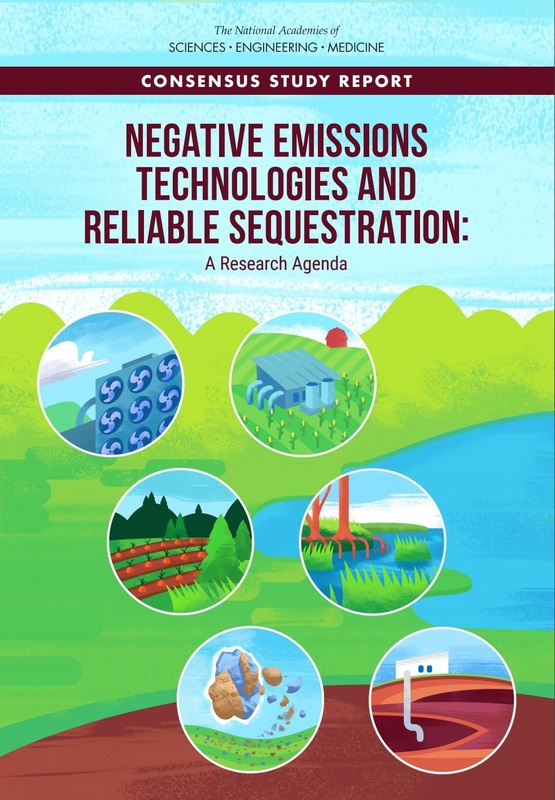 This study aims to develop a detailed research and development agenda needed to assess the benefits, risks, and sustainable scale potential for carbon dioxide removal and sequestration approaches; and increase their commercial viability. The list of CDR approaches to be examined would include land and coastal (i.e., tidal wetlands, seagrass meadows, and mangroves) ecosystems management, accelerated weathering, bioenergy with capture, direct air capture, geologic sequestration, and other approaches deemed by the study committee to be of similar viability in terrestrial and coastal environments. NOTE: The statement of task was slightly edited in September 2017 to clarify that the scope of this study is limited to the assessment of any viable approach in the terrestrial and coastal environments. View this study in the Academies’ Current Projects System. This page is derived from the 2015 National Academies report Climate Intervention: Carbon Dioxide Removal and Reliable Sequestration and provides a high-level overview of various approaches to carbon dioxide removal and sequestration, as well as associated estimates for cost and rate of capture and/or sequestration. The National Academies of Sciences, Engineering, and Medicine provides independent, objective advice to improve government decision making and public policy and to increase public understanding in matters involving science, engineering, technology, and health. Reports from the Academies are unique, authoritative expert evaluations. Each report is produced by a committee of experts selected by the Academies to address a particular statement of task. Committees are balanced to represent various points of view, and committee members are screened for conflict of interest. Committee members serve without pay and deliberate free of outside influence. Efforts are made to engage the public early on in studies so that all viewpoints are made known to the committee. Watch this website for information about public meetings. This project is sponsored by the U.S. Department of Energy, the National Oceanic and Atmospheric Administration, the Environmental Protection Agency, the United States Geological Survey, the V. Kann Rasmussen Foundation, the Linden Trust for Conservation, and Incite Labs, with support from the National Academy of Sciences’ Arthur L. Day Fund.